Ages: 2 years and younger. 1 adult over 18 years must accompany the child, to a maximum of 2 children per adult. Babies in car seats, carriers, snugglies etc. are not allowed. Prices: $5.00 per visit . On the first visit there is a $5 insurance fee (paid once annually). Booking a Spot: Phone the front desk up to 24 hours in advance of the class to secure a spot. You are not required to call ahead however may be turned away if maximum number of participants is reached. Late Policy: If you are more than 5 minutes late for this program your child will not be permitted to join (this is for safety and class organization). Ages: 5 years and younger. 1 adult over 18 years must accompany the child, to a maximum of 2 children per adult. Babies in car seats, carriers, snugglies etc. are not allowed. 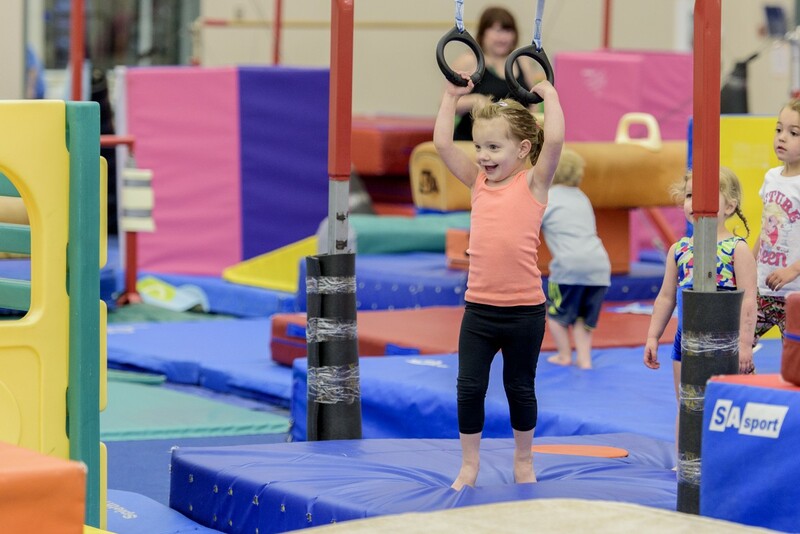 KinderGym is a government licensed preschool program for children ages 3-5 combining both preschool activities as well as gymnastics. 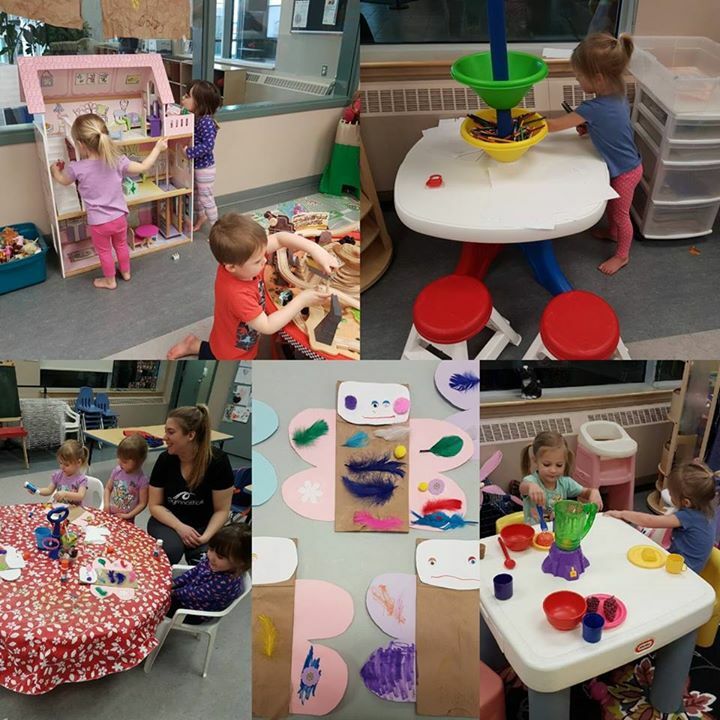 At KinderGym your child is learning through play in a social environment. Our play centers and crafts will help him/her to learn to share and work on fine motor skills. 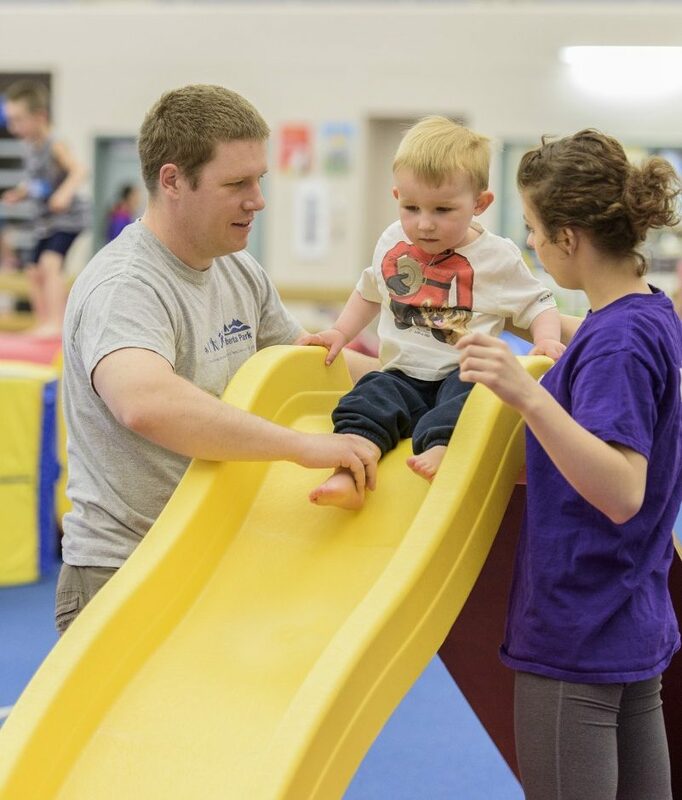 Our time in the gym helps to burn off some energy and work on gross motor development, balance and coordination. The children will be busy learning different activities and themes each week. Theme weeks may include: Getting Acquainted, Winter, Groundhog Day, Opposites, Valentines, Family, Teeth, St. Patrick’s Day, Easter, Zoo, Big Machines, Dinosaurs, etc. All participants must be fully potty trained and 3 years of age prior to the start date of the program. Registration for this program can only be done in person as hard copy paperwork is required for each participant. 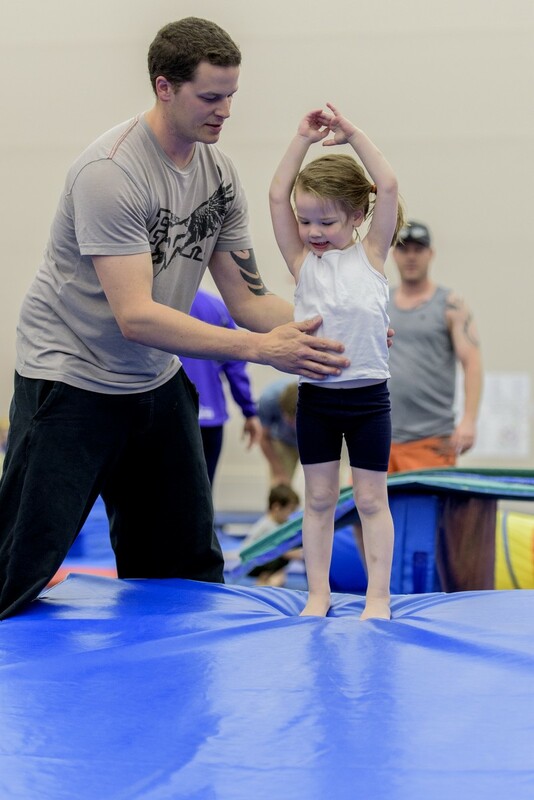 The Parent & Baby program introduces children to motor development progressions of basic gymnastics through play in the encouraging presence of one parent or guardian. There are circuits set up on the floor, beams, bars, and other areas, that may be used if other groups are not using the circuits. 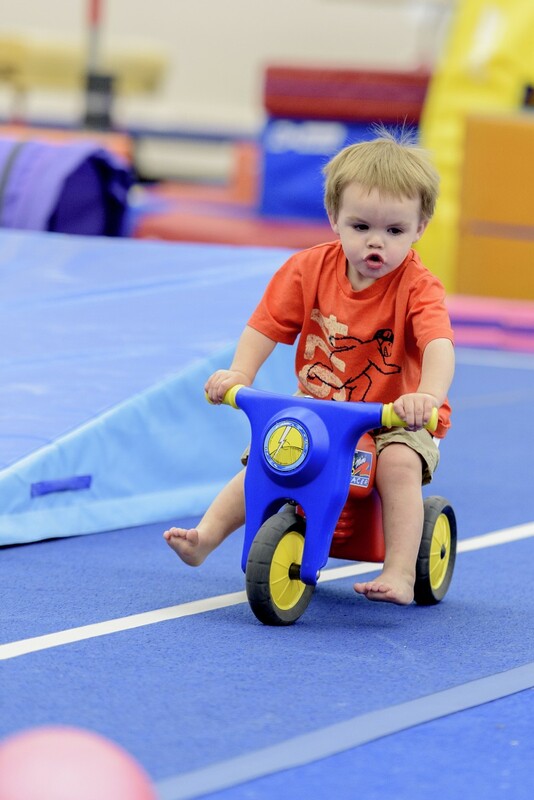 Approximately 5-minutes of free play in the foam pits incorporated into most classes. The program focuses on developing the whole child in a fun and stimulating environment. Parents can expect a 5-10 minute group warm-up with other children, and then groups are split into their respective age categories. After warm-up, groups will go to each of the circuits set up for each particular class. 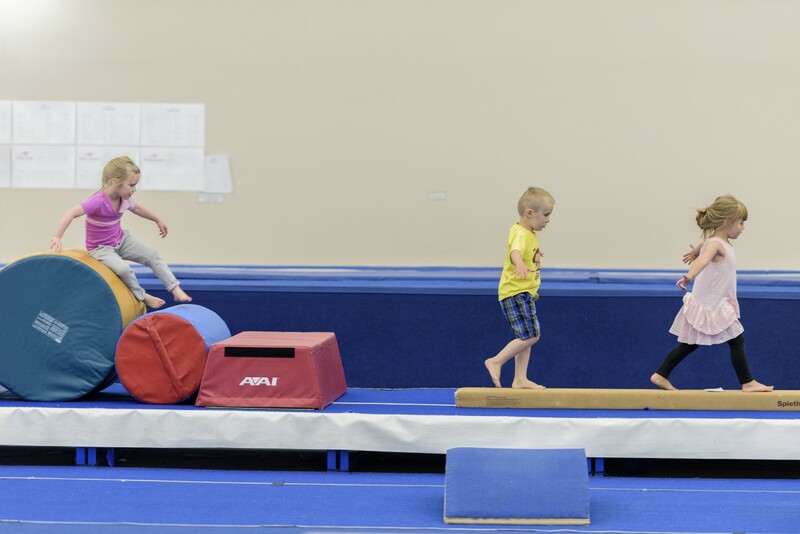 The Pre-School program continues to build on basic gymnastics skills with the emphasis on building their self-esteem through independence. The class is for children who are ready to work with their coach without the assistance of a parent or guardian. Parents can expect a 5-10 minute group warm-up with other children that are a variety of ages, and then groups are split into their respective age categories. For children 8 and under – age limits are due to weight restrictions on the structures. 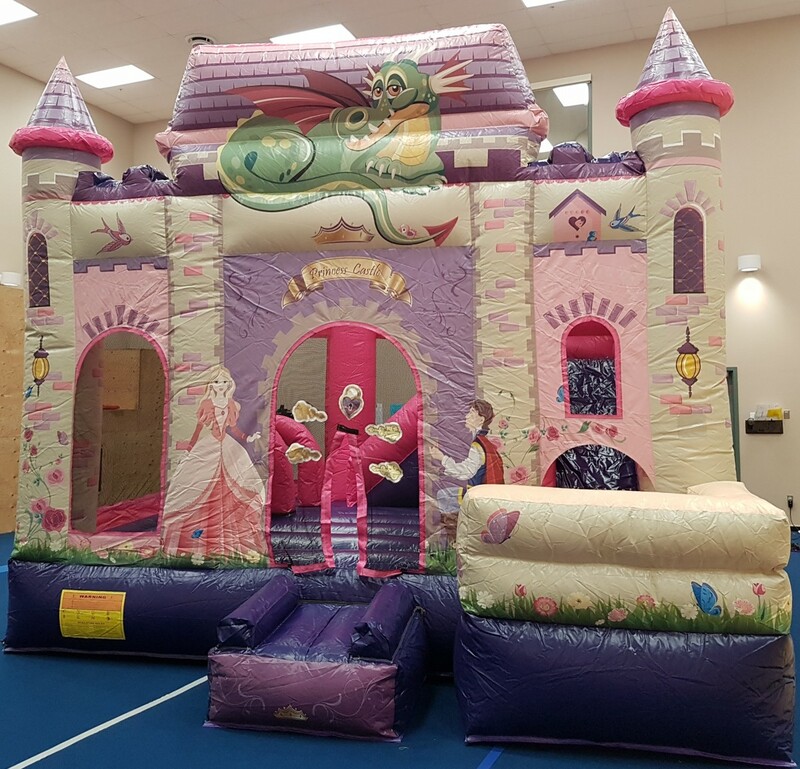 Spend one hour bouncing with your buddies in our bouncy castles! This is a free play non-structured party set up in our dance studio. Includes 12 participants max. The package includes one hour in the party room after where you can bring cake, ice cream, games, etc. The Party room is located upstairs, the hour in the room includes set up and take down.